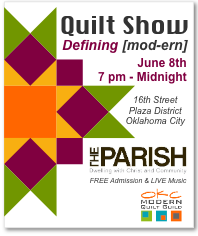 OKC Modern Quilters: QUILT SHOW!!! I hope y'all have made plans to be at the quilt show already and all of the info below is just redundant. But, in case you haven't, please come and check it out. Live/Free music to enjoy, coffee, and of course our quilts! The space looks great. I'm so proud of our participants, and our crew who helped put this all together! It's going to be a great night!! !